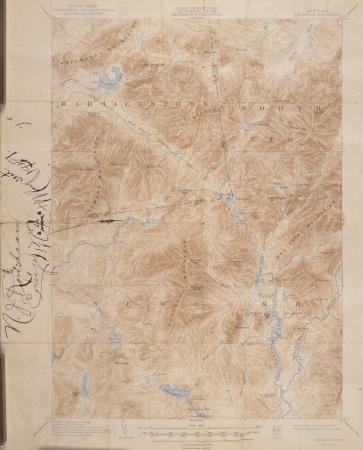 Topographical map of the Santanoni Quadrangle, in the Adirondack Mountains, inscribed by Noah John Rondeau. Rondeau, was known as a resident hermit of the Adirondack Mountains. He made his home in the Cold River region of northern Essex and southern Franklin counties. Source: Adirondack Museum Library, Noah John Rondeau papers, MS 61-7.